There's not much fuel-economy penalty with the long-wheelbase 750Li, so you have our permission to go long. The V-12? We're not sure the $50,000 extra on the tab is worth its scant increase in speed. Call us converts: The latest 2010 BMW 7-Series turns our eyes more than ever and drives with real big-guy brio. The 2010 BMW 7-Series has come in from the cold. Last year brought the newest edition of the bigger Bimmer-and in its fifth generation, the luxury sedan got a style-ectomy that reversed the awkward proportions and surfaces of the 2002-2008 model. The quintessential BMW driving feel remains intact, despite a horde of new electronic interventions and a big uptick in size. 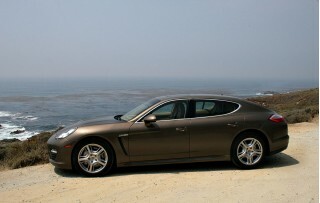 This year, with the addition of a V-12 version, the 2010 7-Series is priced from about $82,000 for the V-8-powered 750i. The price tag rises to more than $132,000 for the V-12 760Li. The most frequently named competitors include the Mercedes-Benz S-Class, Audi A8, Jaguar XJ, and Lexus LS; we'll add the new Porsche Panamera to that list. Last year, the 7-Series went from being one of our least-favorite luxury sedans to one of our most coveted. Mostly it's because of the styling. BMW had a mission to make the 7er look different-and that 2002-2008 7-Series took it to extremes. The greenhouse grew tall, the fenders drooped, and the trunklid sprouted a vestigial double deck. Now, the newest 7-Series looks much more relaxed and much happier. The glass areas are slimmer, the shoulders are tailored just right, and the decklid's been smoothed over, with the trunk and taillights more tightly integrated. The Hofmeister kink, at the junction of its D-pillar and rear doors, is sublimely sporty. Even the grille looks pleased-it splits into a wider grin, and the front aero dams dip low for a grounded look. The long-wheelbase versions don't tip the shape out of balance at all, with a small stretch in glass areas in the rear doors. We give a "well done" to the cockpit, too. We didn't like the almost chaotic mix of buttons, screens, and knobs in the last version. Here, BMW organizes the clutter and streamlines the shapes so that the 2010 7-Series' cabin "reads" more easily and more cleanly. The instruments can be completely blacked out when needed; otherwise, they glimmer softly amid densely grained wood trim, ceramic-finished knobs, and the futuristic controllers that direct the transmission and driving dynamics, as well as the iDrive system (more on that later). The V-8 engine in the standard 7-Series delivers the kind of power you used to expect from BMW's M cars. The 400-horsepower, 4.4-liter twin-turbo V-8 develops most of its torque as early as 1,750 rpm, and it pushes the 7er almost as well as the old V-12 did-with just a faint whistle from the turbochargers. Hooked into a cooperative six-speed automatic transmission with sport-shift mode, the 750Li can claim a 0-60 mph time of about 5.0 seconds and a top speed of 155 mph. Fuel economy checks in at a middling 15/22 mpg for the 750i and 14/21 mpg for the 750Li. This year, BMW adds more driving hardware to the existing 7-Series sedans. Its xDrive all-wheel-drive system is available on V-8 sedans. It's a sophisticated system that can send up to 80 percent of torque to the rear wheels to improve traction. The 750i xDrive and 750Li xDrive models earn EPA ratings of 14/20 mpg. There's also a new M Sport package for rear-drive vehicles; it adds a body kit, 19- or 20-inch wheels, a special steering wheel, and Active Roll Stabilization (more on this later). New this year, a brake-regeneration system captures braking energy to run the alternator for slight fuel savings. And we'd be remiss if we didn't mention the new uber-Bimmer, the long-wheelbase $136,000 BMW 760Li. Fitted with a 537-hp twin-turbo V-12, a new eight-speed automatic, and rear-wheel drive, and weighing in at 4,800 pounds, this version teleports drivers from 0-60 mph in 4.6 seconds. Fuel economy is rated at 13/19 mpg. 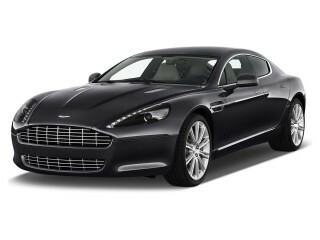 We haven't driven the V-12 edition yet, but when we do we'll add to this review. One last word on the 2010 BMW 7-Series lineup: BMW had planned on introducing an ActiveHybrid 7 for the 2010 model year, and we've previewed it across High Gear Media as a 2010. The 7-Series Hybrid's still coming, but it's been switched to the 2011 model year (you can read our initial impressions here). Also, the 7-Series will add six-cylinder and V-8 Alpina trim editions in the 2011 model year. We'll bring you the 2011 review just as soon as cars are available. No matter whether it's short or long, the 7-Series feels unbelievably nimble for a car so lengthy and heavy. It's stable and feels planted at the 135 mph on the Autobahn, as our first test drive back in 2008 proved. While it weighs plenty, the 7-Series' lightweight control-arm independent suspension front and rear gives its responses an airier touch. BMW has fitted optional active rear steering, which turns the rear wheels opposite the fronts in some situations to enhance turn-in; variable steering assist; Active Roll Stabilization, which engages anti-roll bars to limit excessive body motion; and on the 750Li, an air suspension. The somewhat maddening Driving Dynamics Control is also in charge of shock firmness, transmission shifts, steering heft, and throttle response-but drivers can twiddle with the settings to fit their habits. In our experience with the 750Li, it's best to leave the 7-Series in automatic modes and to trust the transitions to its transistors. Braking is exceptionally strong, as we've come to expect, with many electronic controls to prepare, dry, control, and unlock brakes in extreme circumstances. 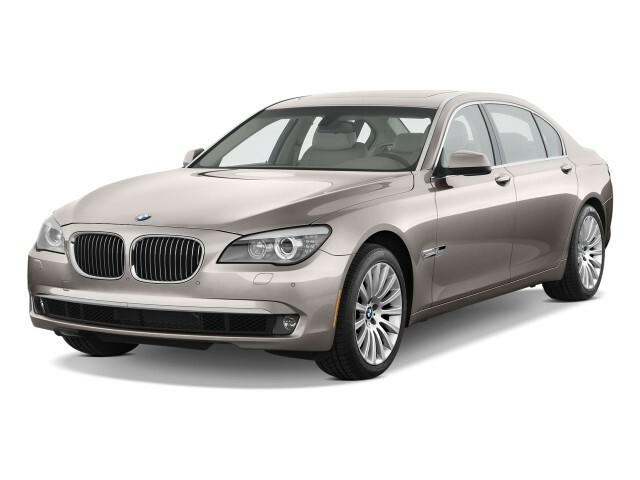 Prepare to be astounded inside the 2010 7-Series, especially in long-wheelbase versions. 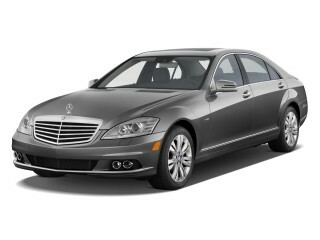 The cabin's just astounding, with so much passenger room, it's close to the long-wheelbase-only 2010 Mercedes-Benz S-Class. We've settled into the multi-adjustable front seats for hours-long drives with just a few quick clicks of the seat controls, and found plenty of headroom, shoulder room, and legroom. The long-wheelbase version adds 5.5 inches of rear-seat legroom, not that you'd complain about the more compact version. We've been able to cross legs in back, with front passengers reclined, and still have room to move. The backseat can be equipped with heating, ventilation, and massaging controls, along with four-zone climate control. The wood and leather trim is easily the equal of a Rolls-Royce quality-fitting since BMW has owned Rolls-Royce for a decade. We do think the techno-driven styling of some controls draws down the cabin's serene statement, but wind and engine noise are extremely low, and all cars we've examined up close had faultless build quality. Neither NHTSA (National Highway Traffic Safety Administration) nor the IIHS (Insurance Institute for Highway Safety) has crash-tested the 2010 BMW 7-Series. We're giving it the benefit of the doubt, but our high safety score will change as new data becomes available. The 7-Series' safety gear earns the big number. It includes front, side, and side-curtain airbags; rear-seat head protection airbags; active head restraints on the front seats; and knee airbags. Stability and traction control are standard, along with anti-lock brakes. On the options list, there's a Driver Assistance Package with blind-spot detection; a lane-departure warning system that vibrates the steering wheel when the car drifts from its lane; and automatic high beams. A 180-degree camera, a rearview camera, and parking sensors help the 7-Series steer out of parking spots. We're less sold on the 7-Series' head-up display, which projects speeds, navigation instructions, and other functions into the driver's view. And you too might be surprised that the big sedan has Hill Descent Control standard-for those downhills in icy, messy weather, not for off-roading-with an option for night vision and active cruise control. Every 2010 BMW 7-Series comes with luxury features that seem appropriate and a heady dose of electronic gadgets that border on overwhelming. Chief among them is iDrive. We've complained about its complexity, but it's been reprogrammed and augmented with memory presets and direct-to-function buttons that ease your way through navigation, climate, and audio functions-but dial back the intention of clearing the dash of dozens of buttons. The navigation system stores maps on an 80GB hard drive and displays them on a gorgeous 10.2-inch LCD. You can zap destinations to your car via Google Maps (in Europe, the 7er has wide-open access to the Internet). DVDs work in the head unit, which also includes HD Radio; a six-DVD changer, satellite radio, and iPod connections can be fitted. There's also a rear-seat entertainment system optional on V-8 cars. Almost everything is made standard on the V-12 760Li-as it should be for its nearly $140,000 price tag. The 2010 BMW 7-Series makes the previous version look like a rough draft. The 2010 BMW 7-Series has come in from the cold. Last year, the 7-Series went from being one of our least-favorite luxury sedans to one of our most coveted. Mostly it's because of the styling. BMW had a mission to make the 7er look different-and that 2002-2008 7-Series took it to extremes. The greenhouse grew tall, the fenders drooped, and the trunklid sprouted a vestigial double deck. Now, the newest 7-Series looks much more relaxed and much happier. The glass areas are slimmer, the shoulders are tailored just right, and the decklid's been smoothed over, with the trunk and taillights more tightly integrated. The Hofmeister kink, at the junction of its D-pillar and rear doors, is sublimely sporty. Even the grille looks pleased-it splits into a wider grin, and the front aero dams dip low for a grounded look. The long-wheelbase versions don't tip the shape out of balance at all, with a small stretch in glass areas in the rear doors. We give a "well done" to the cockpit, too. We didn't like the almost chaotic mix of buttons, screens, and knobs in the last version. Here, BMW organizes the clutter and streamlines the shapes so that the 2010 7-Series' cabin "reads" more easily and more cleanly. The instruments can be completely blacked out when needed; otherwise they glimmer softly amid densely grained wood trim, ceramic-finished knobs, and the futuristic controllers that direct the transmission and driving dynamics, as well as the iDrive system (more on that later). Edmunds: "stately, substantial and with a hint of aggression"
Jalopnik: "the design team has gone to great effort to correct the car's awkward-looking posterior"
Car and Driver: "trunklid is far less bulbous"
Car and Driver: "Only experts will be able to tell the 760 models from the more pedestrian 7-series variants"
Motor Trend: cabin is "a mix of fine leather and polished woods"
Autoblog: Black Panel leaves "only the gauge rings and needles...visible when the car is shut off"
Automobile: "the shifter has moved back to the center console"
The 2010 BMW 7-Series delivers ultimate-driving-machine performance, despite its size and heft. The V-8 engine in the standard 7-Series delivers the kind of power you used to expect from BMW's M cars. The 400-horsepower, 4.4-liter twin-turbo V-8 develops most of its torque as early as 1,750 rpm, and it pushes the 7er almost as well as the old V-12 did-with just a faint whistle from the turbochargers. Hooked into a cooperative six-speed automatic transmission with sport-shift mode, the 750Li can claim a 0-60 mph time of about 5.0 seconds, and a top speed of 155 mph. Fuel economy checks in at a middling 15/22 mpg for the 750i, 14/21 mpg for the 750Li. No matter whether it's short or long, the 7-Series feels unbelievably nimble for a car so lengthy and heavy. It's stable and feels planted at the 135 mph on the Autobahn, as our first test drive back in 2008 proved. While it weighs plenty, the 7-Series' lightweight control-arm independent suspension front and rear gives its responses an airier touch. BMW's fitted optional active rear steering, which turns the rear wheels opposite the fronts in some situations to enhance turn-in; variable steering assist; Active Roll Stabilization, which engages anti-roll bars to limit excessive body motion; and on the 750Li, an air suspension. The somewhat maddening Driving Dynamics Control is also in charge of shock firmness, transmission shifts, steering heft, and throttle response-but drivers can twiddle with the settings to fit their habits. In our experience with the 750Li, it's best to leave the 7-Series in automatic modes and to trust the transitions to its transistors. Motor Trend: V-8 has a "broad, robust torque band"
Edmunds: "we accelerated a 750i from zero to 60 mph in a scant 5.2 seconds"
Car and Driver: V-12 "turbochargers are relatively small for quick throttle response and minimal lag"
Edmunds: 760Li "accelerates with complete authority"
Motor Trend: automatic is "faster, smoother, and more economical"
Automobile: "manual shifting can be accomplished once the joystick-style selector is tilted to the left"
Motor Trend: "eight-speed transmission is attentive and smooth enough, though...it can seem busy"
Automobile: "feels much smaller than it is"
Motor Trend: "only the Normal setting feels harmonious. In Comfort, the soft damping can't control wheelhop, and in Sport, there's an agile car waiting to come out, but the artificial steering suppresses your urge to find it, and the ride becomes too wooden to allow good traction"
Edmunds: "more athletic but also has a stiffer ride quality"
The 2010 BMW 7-Series suits almost all bodies well, with firm and cozy seats, vast rear-seat room, and exquisite fit and finish. ConsumerGuide: L versions "ride on a wheelbase that is 5.5-inches longer"
Motor Trend: "the most luxurious-feeling interior yet from BMW"
Edmunds: rear seats are "accommodating for taller adults"
Car and Driver: "we prefer the cushy lounge seats of the Lexus LS to the slightly firmer BMW chairs"
Motor Trend: "At the rear, the two outer seats recline and tilt"
Car and Driver: "The only time you hear the V-12 is when you're sitting at idle, where you hear a silky purr closer to the sound of BMW's inline-six than a V-8"
Motor Trend: "The engine merely whispers"
The 2010 BMW 7-Series pulls out every trick in the book-and creates some new ones-to keep safe on the road. Neither NHTSA (National Highway Traffic Safety Administration) nor the IIHS (Insurance Institute for Highway Safety) has crash-tested the 2010 BMW 7-Series. We're giving it the benefit of the doubt, but our high safety score will change as new data becomes available. The 7-Series' safety gear earns the big number. It includes front, side, and side-curtain airbags; rear-seat head protection airbags; active head restraints on the front seats; and knee airbags. Stability and traction control are standard, along with anti-lock brakes. A 180-degree camera, a rearview camera, and parking sensors help the 7-Series steer out of parking spots. On the options list, there's a Driver Assistance Package with blind-spot detection; a lane-departure warning system that vibrates the steering wheel when the car drifts from its lane; and automatic high beams. We're less sold on the 7-Series' head-up display, which projects speeds, navigation instructions, and other functions into the driver's view. And you too might be surprised that the AWD versions of the big sedan has Hill Descent Control standard-for those downhills in icy, messy weather, not for off-roading-with an option for night vision and active cruise control. ConsumerGuide: "available safety features include ABS, traction control, antiskid system, front and rear side airbags, knee airbags, and curtain side airbags"
Motor Trend: head-up display "is easily legible"
Motor Trend: sideview camera "lets the driver view oncoming traffic when trying to enter a road from, say, an alley or garage exit"
The 2010 BMW 7-Series is a tech-lover's dream, and with the simplification of iDrive it's now more accessible than ever. Every 2010 BMW 7-Series comes with luxury features that seem appropriate and a heady dose of electronic gadgets that border on overwhelming. Chief among them is iDrive. We've complained about its complexity, but it's been reprogrammed and augmented with memory presets and direct-to-function buttons that ease your way through navigation, climate, and audio functions-but dial back the intention of clearing the dash of dozens of buttons. The voice-activated navigation system stores maps on an 80GB hard drive and displays them on a gorgeous 10.2-inch LCD. You can zap destinations to your car via Google Maps (in Europe, the 7er has wide-open access to the Internet). DVDs work in the head unit, which also includes HD Radio; a six-DVD changer, satellite radio, and iPod connections can be fitted. There's also a rear-seat entertainment system optional on V-8 cars. Almost everything is made standard on the V-12 760Li-as it should be for its nearly $140,000 price tag-but options remain, including night vision, massaging rear seats, adaptive cruise control, and a choice of wood trim. Edmunds: "Some may still find the iDrive system a bit complicated, but with use over time, we think the improved layout is an elegant solution to a button-heavy dashboard"
Motor Trend: "high levels of standard equipment"
Car and Driver: "continuing to call it iDrive is almost an insult to its vastly improved control strategy"
Edmunds: "pinnacle of technology and luxury accoutrements"
Jalopnik: comfort features "further add to a truly exceptional driving and riding experience"
Car and Driver: second air-conditioning unit "is nice, we suppose, but it looks like an aftermarket addition and takes up nearly 1.5 cubic feet of trunk space"
excellent gorgeous n your connected to the car ....a g i l e !! !